Martha Wells, Stories of the Raksura, Volume 1: The Falling World and The Tale of Indigo and Cloud. Night Shade Books, 2014. pp 206. ISBN 978-1-59780-535-3. $15.99. This is the first of two projected volumes of novellas and short stories set in the world of the Raksura; the other volume’s projected publication date is April 2015. These books follow Wells’s trilogy of The Cloud Roads (2011), The Serpent Sea (2012), and The Siren Depths (2012), though the reader doesn’t necessarily have to have read them in order to enjoy this book. Stories contains two novellas that have never before been published, two short stories that have previously appeared on the author’s website, and three brief appendices detailing the characters and the world of the books. Altogether, the material forms what can be a useful introduction to the Raksura, and a delightful present for fans of the series. Wells’s worldbuilding emphasizes two points of departure from common SF/F worlds. First of all, the Raksura are human only in emotion, and in their “groundling,” or humanoid, forms. The rest of the time they are exotically alien: scaled, multi-colored, occasionally winged. Emotional gestures are communicated by relaxed or upright frills, the showing of teeth and the occasional displays of claws. Even better, as the point of view characters are mostly Raksuran themselves, this is all presented as the norm. The other narrative departure is through gender roles: Raksuran courts are matriarchal, with women as the dominant rulers and warriors and men most often as teachers and caregivers. Further than that, the Raksura in their groundling forms are dark-skinned. This is a world where “whiteness” isn’t even a concept, let alone a rule of thumb. The “courts” also have little to do with our human governments or royalty, and refer instead to kinship ties within a localized group. The first novella, ‘The Falling World,’ is an adventure story set after the original trilogy. Moon is consort to the Queen Jade, who goes missing while on a diplomatic trade mission. Moon insists on going to search for her with a party of warriors; throughout multiple references are made to his “headstrong” nature that must be forgiven. Visitors from a rival court are disapproving at first, but later commend Moon for his bravery in insisting on searching for his mate. 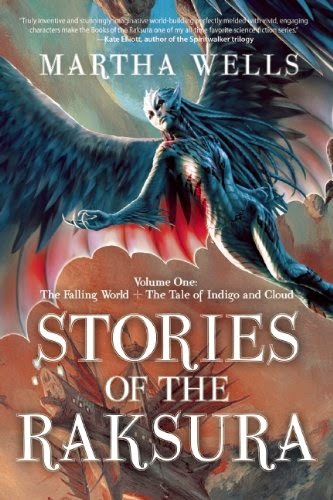 The other novella, ‘The Tale of Indigo and Cloud,’ is a prequel story that sets up some of the world of the books, particularly the setting of the Indigo Cloud court where most of the characters live. Again, we see the inversion of traditional gender roles when the headstrong Queen Indigo rescues Cloud, a consort to a queen in another court who abuses him verbally and physically. This story reads like a semi-typical romance, except it takes place from the point of view of Indigo’s mother Cerise, the ruling Queen of the court, who is more concerned with the political conflicts present than the emotional ones. A brief epilogue has the present day characters of Indigo Cloud—including Moon—coming across the story in a book. The two short stories are quite short indeed, and also prequels to the novels. The first, ‘The Forest Boy,’ is about a young Moon hiding his true nature from friendly humanoids and finding a home for a brief period of time. The other, ‘Adaptation,’ is about Chime’s unexpected shift from the mentor class to the warrior class; in some ways, this story can be read as a metaphor for puberty, with unexpected bodily changes and emotional frustrations and outbursts. This is also the one story that does more than glance at implied but largely unspoken bisexuality for all Raksuran characters; early on, Chime awakes to find another male has slipped into his bed—by accident. Chime treats the mistake with good-natured annoyance that the male was there for another and not him. As Moon reflects in another story, sexuality among the Raksura largely consists of, “if you want it, ask for it.” There is no angst or confusion about this treatment (in this book, at least), which makes a nice change from older works where overcoming internalized homophobia makes up a great deal of the emotional—if not actually the narrative—arc. Overall, the book reminded me of the pleasure I took in extended universe short story collections like those by Anne McCaffrey or Marion Zimmer Bradley. The majority of single-author short story collections published these days tend towards collections of previously published material, while multi-author collections tend to be overwhelmingly thematic. A collection like this is most enjoyable because of the uniform quality of material in it; I would hesitate to say if any of the stories is “better” than the others because they were all easy reading. None of them is about Big Ideas per se, but rather character and world explorations that many readers will want for their own sake. Perhaps I have just been reading the wrong books of late, but this one made a nice change; it was a book I could sit down to read, relax, and enjoy thoroughly. Suffice to say that I have neglected reading the earlier trilogy and plan to remedy that in the immediate future.